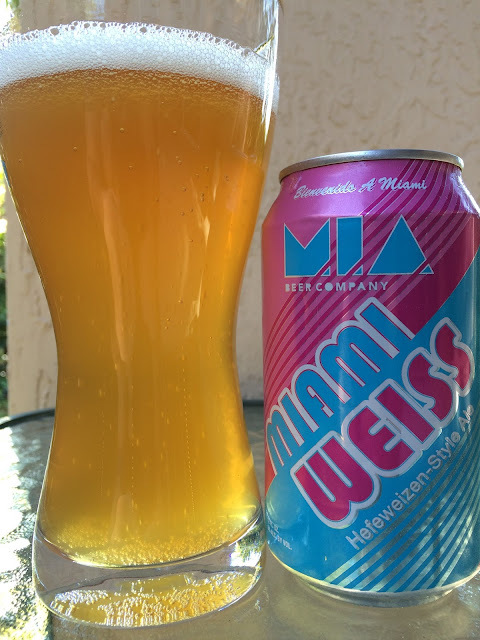 Today I'm checking out MIA Beer Company's Miami Weiss. Gotta be Don Johnson in a glass, right? Very nice electric pink and baby blue can, reversed on the opposite side for the Spanish-speaking crowd. This was brewed and canned by Lakeland's Brew Hub on FEB/15/16. 6% alcohol. Light fruit, light spice, really had to work for the aroma. The flavors, however, jump at you. Nice wheat flavor and body to start. Spicy cloves along with plenty of orange and banana come next. Great carbonation enhances the spices. Crisp, clean, tasty, refreshing. If you are in Miami, visit the brewery!